We offer a wide selection of nonwoven abrasives for surface conditioning. Used in a wide variety of applications for deburing and polishing metals. Use with our Type R quick change holders. Heavy mesh discs abrasive impregnated for stripping paint, rust removal, and other clean-up jobs. 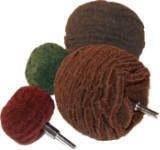 6" x 9" hand pads for cleaning, scrubbing, rust removal, and other applications.. Concentrated layers of nonwoven surface conditioning material for getting into curved surfaces and tight places.